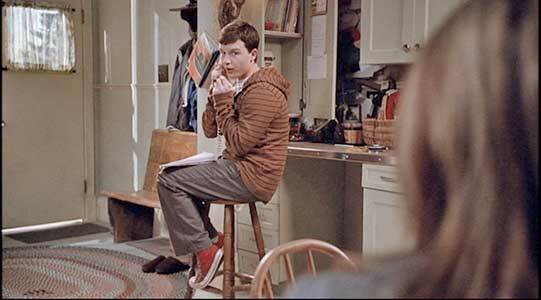 Noel Fisher wears red high top Converse “Chuck Taylor” All Stars in the film. Todd shows off Christmas to his mom, Mary Ann McCray. Todd McCray (Noel FIsher) is a developmentally challenged young man now twenty years old. He still lives with his parents Mary Ann (Linda Emond) and George (Bruce Greenwood) on their farm in Kansas. (The film was mostly shot in Saskatchewan, Canada). We are never told exactly what was the cause of Todd’s disability, but he is handling it quite nicely, accepting that he can’t do things that others his age could, and helping his parents doing the daily chores around their property. George proudly describes it this way: “Todd has his own way of thinking about things.” Todd has a happy disposition and something he does have going for him is his ability to care for injured animals. In two early scenes we see him rescuing a ground squirrel and nursing an injured condor, now ready to release back into nature. The one thing that Todd doesn’t have is a pet of his own. The McCray’s don’t have any dogs or cats on their property, and this is because of Todd’s father George. Todd is talking with Brianna Lewis at the animal shelter. The film contains a number flashback scenes when George McCray was a child and when he was serving in the military during the Vietnam war. As a kid, George had a pet dog that he was very close to; the two were inseparable. During the war, George and his platoon stumbled on a stray dog that quickly became their mascot. But in a traumatic series of events, a surprise attack on George’s platoon results in a serious leg injury for George, and their dog goes missing. George is flown out of there on a medical helicopter before he can do anything about rescuing the dog. This causes him tremendous guilt along with the post-traumatic stress from his injury. For that reason, he has avoided all contact with dogs ever since. His focus now is on farming, his extended family which includes three other children older than Todd, and taking care of Todd in a kind but protective manner. Ironically, there are no flashback scenes involving Todd that might explain why he is developmentally challenged or when his disability was first discovered. Todd showing off tricks that Christmas can do at a family gathering. The main story line of A Dog Named Christmas takes place during the two-week period before and just after Christmas. Todd is in touch with Brianna Lewis (Carrie Genzel) the manager of the local animal shelter due to his caring for injured animals. When she tells him that the shelter is running a special campaign that encourages people to temporarily adopt a dog for Christmas, Todd of course wants to participate, but is confused when his father seems dead set against it. Eventually he is able to make a deal with George, he must completely clean his room (which is quite a mess) and they must return the dog on December 26, no whining or questions asked. Todd cleans his room, so the next day they are off to the shelter, where Todd is captivated by a yellow labrador, who he names Christmas. Todd is so happy with his dog he wants others to have the experience. Soon he is on the telephone to all of their family’s friends, and when that isn’t enough he convinces the local television station to do a feature on the adoption program. The publicity is successful, and all the dogs are spoken for. Christmas turns out to be a wonderful family dog, so it becomes pretty obvious where the story line is heading, complete with some twists and turns along the way. Todd gets on the telephone to try and hustle up more people to adopt a dog for Christmas. A Dog Named Christmas is a pleasant family movie, the kind of story you expect from Hallmark. The most important message it contains has to do with Todd. He shows us that even with his disability he can have a happy and mostly normal life. Noel Fisher plays Todd with a doe-eyed simplicity but also with some real backbone, showing us that Todd can be determined and principled when it comes down to things he believes in. The rest of McCray clan is well cast, although we don’t learn much about any of the others except for George, who narrates throughout and gives us simple dialogue about life that isn’t overbearing. The film highlights country life which is quite a contrast from modern city life. The message we get from director Peter Werner is that life can be beautiful if it is kept simple. Combine that with a lovable yellow labrador named Christmas and you have a good 94 minutes of holiday entertainment. 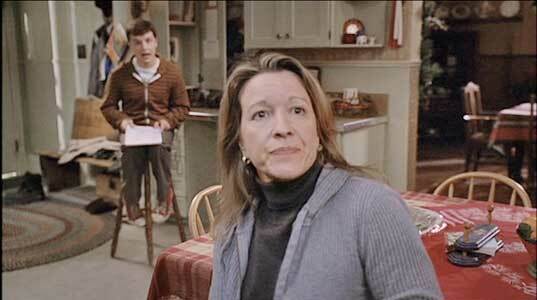 Todd and Mary Ann protest when George tells them getting twelve adopters is enough. 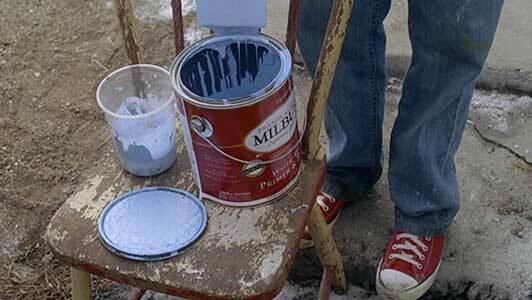 Close up of Todd’s red high top chucks when he is painting a storage building. Noel Fisher in his role of Todd McCray, wears red high top chucks throughout the film. Whatever the weather or season, they are his favorite shoes, and he always has them on. The best close up shots are when he is painting outside at the beginning of the film, and when he is putting them on one morning. 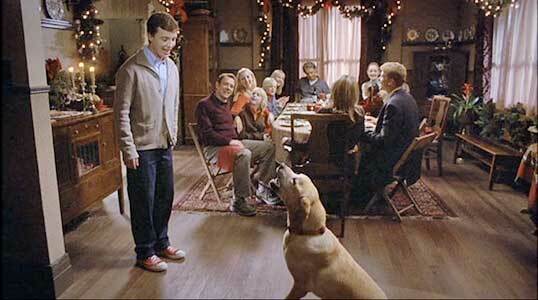 A Dog Named Christmas is another Hallmark family film where the lead young character wears high top chucks. 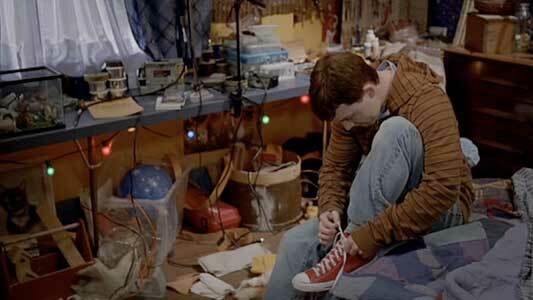 Todd lacing up his chucks in the morning. 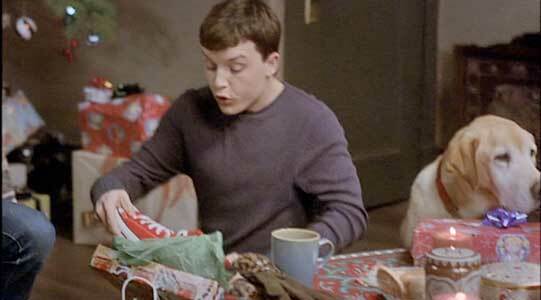 The film never mentions why Todd prefers red high top chucks over all other footwear, until the Christmas scene, when Todd is gifted a new red high top pair by his mother. He acts genuinely thrilled and happy to get a new pair, jumping up and going over to his mom to give her a hug for remembering one of his favorite things. Todd is thrilled to get a new pair of red high top chucks for Christmas. A Dog Named Christmas. (2009) Noel Fisher, Bruce Greenwood, Linda Emond, Ken Pogue, Sonja Bennett, Carrie Genzel, Josh Young, Carrie Ruscheinsky. Directed by Peter Werner.